There’s no such thing as a standard mince pie anymore, it seems. Every year we’re faced with more and more choice when it comes to this traditional festive treat (which, when first created, contained shredded meat in addition to dried fruit), and manufacturers and retailers are getting ever more creative. You’ve got your standard pastry-topped affair, of course, with its traditional boozy, fruity filling. But if you’re looking for something a little different, you’ll find crumble-topped options, those with a swirl of brandy buttercream replacing the pastry lid, others with a layer of salted caramel nestled on top of the mincemeat…the choice is bewildering. Every year it’s the same – but with different options to whet the appetite. And every year we joke that we should do a mince pie taste off to try and single out the best – but we never get round to it. This year is different. We’re doing it – we’re actually doing it! Selflessly forcing ourselves to eat a ridiculous number of mince pies in order to rate them and find the best. Each mince pie has been rated out of five for appearance, pastry, amount of filling and flavour of filling, giving an overall score out of 20. 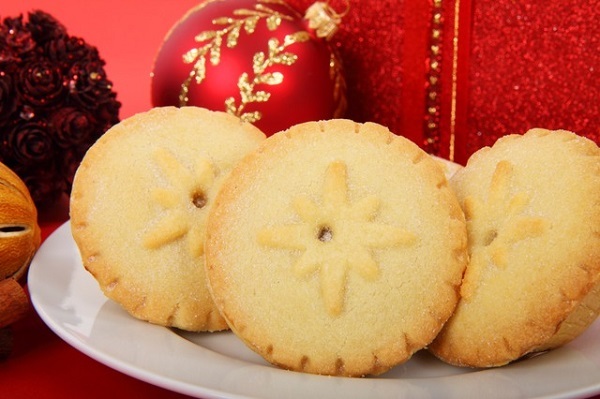 We’ve ranked both the regular mince pie list and the “something different” list from the highest scoring to the lowest – and where possible, we’ve linked to the mince pies on the manufacturer’s/retailer’s website. Enjoy! Appearance: 4.5 – concentric pastry stars, very pretty. Pastry: 3.5 – nice and buttery, good thickness. Flavour of filling: 4 – great texture, nice and boozy. Appearance: 4.5 – pretty star shape on top, nice crimping, and a dusting of crunchy sugar. Pastry: 4 – nice and buttery, good thickness. Quite sweet. Flavour of filling: 4 – plenty of texture, lots of booze. Good amount of spicing – mainly cinnamon. Appearance: 4 – snowflake-topped star pattern, but pastry on top looks very thick. Pastry: 3 – very buttery, far too thick. Very sweet. Flavour of filling: 3.5 – too much booze, too much citrus. Lovely texture though. Appearance: 3 – pretty cut out star in middle but very regular, machine-made crimped edges. Pastry: 3 – a bit buttery, too thick. Flavour of filling: 4 – good amount of booze, decent textured fruit. Appearance: 2.5 – crimped edges, lots of icing sugar. Nothing special. Pastry: 2.5 – Quite thick, a little underbaked in places. Good for those with a sweet tooth – VERY sugary. Plenty of butter. Flavour of filling: 4 – lovely amount of port and brandy, nice level of spicing, great texture. Appearance: 3.5 – holly leaves, crimped edges, classic but quite rough. Pastry: 1 – a bit cardboardy, dry, crumbly. Not very buttery. Amount of filling: 5 – packed to the brim. Flavour of filling: 2.5 – quite gloopy, good booze flavour, not as much texture as some of the others. Appearance: 3 – pretty design with a star in the middle but very rough. Flavour of filling: 2.5 – too liquid, generic flavour, nothing distinctive or really Christmassy. Appearance: 4.5 – nice pastry lattice on top, good glaze. Pastry looks quite thick. Pastry: 4 – different to most of the others: crunchier. Very buttery – and thankfully not as thick as it looks. Amount of filling: 4 – designed to be shallow tarts but pretty well filled. Flavour of filling: 4 – can taste the sloe gin – not the booziness, but the flavour. Texture a little softer and less defined than some of the others. Appearance: 3.5 – swirl of buttercream instead of pastry on top. Pastry: 2.5 – a little buttery, quite thin. Flavour of filling: 3.5 – can taste the booze. Dried fruit has a good flavour. Buttercream includes a decent amount of brandy – maybe a bit TOO much, as it overpowers the mincemeat. Appearance: 2.5 – attractive holly leaf and berries, but the pastry looks anaemic and stodgy. Pastry: 3 – better than it looks, but fairly bland and on the soft side. Amount of filling: 2.5 – only half full. Appearance: 2 – don’t look particularly appealing. Pastry: 3 – tastes lovely and buttery, but incredibly soft, crumbles straight away. Amount of filling: 4 – nice and full but more frangipane than mincemeat. Flavour of filling: 3.5 – frangipane has a lovely, sweet marzipan-like flavour, soft and spongy. Mincemeat has plenty of texture but its flavour is overpowered as there’s so little. Appearance: 3.5 – two pretty concentric stars, crimping not very well defined. Pastry: 3 – a bit bland. Slightly buttery. VERY crumbly. Appearance: 2 – just plain icing, not very inspiring. Pastry: 1.5 – tastes pretty cheap, crumbly, quite sweet. A bit bland. Quality of filling: 2 – very sweet. Good textures, not much spice. Quite tart. Icing very thick, a bit overpowering.